Inspired by the design of a plastic toy snake, these armored cables protect the weakest points where fraying and breaks happen most—right at the connectors. Sleek ball joints allow for secure flexibility and rotation, shield the cables within, and can pop out to maintain an angle. Weight: Lightning: 0.05 lb. ; Micro-USB: 0.1 lb. Wish it came in a longer length! I have had trouble with cords bending and breaking the connection at the phone. The cord appears to have solved the problem! Time will tell!! Does what is advertised. Wish came in longer lengths and would restock the colts. Add more colors too. Wes Goulbourne got the inspiration for Snakable—a durable USB cord that won’t fray or break—from, believe it or not, plastic toy snakes. Wes was frustrated with repeatedly replacing cables. After many designs that weren’t quite right, he looked to nature for a solution. He thought of a snake’s movements, and then remembered a jointed, plastic toy snake he had as a child. Inspiration struck. The ball joints at either end of each Snakable cable not only allow a new degree of flexibility, they also protect the cable within. The spheres can pop in and out to maintain an angle, and provide relief where cables see the most strain—at the connector. For Apple users, Snakable's lightning cables are MFi (approved by Apple). 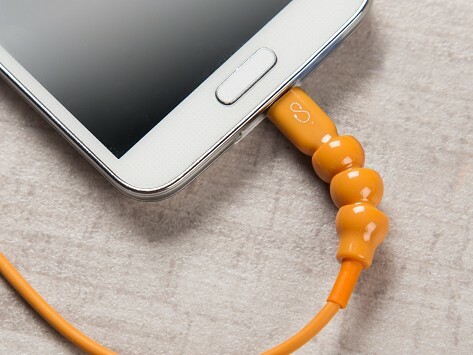 For Android users, they also make a micro-USB cable. Wherever you charge your devices, your frayed days are over.